The SBE has invited a representative of the FCC, James Roop, as well as Dennis Baldridge, a member of the SBE Technical Presenters Group, to talk about common broadcast related violations. They will categorize them into groups and discuss how to prevent them. And you have the opportunity to ask the FCC representative questions specific to your station! Subjects of the webinar include FCC enforcement actions, an analysis of the FCC’s top 10 violations, steps to an appropriate response for NOV/NAL, preventing violations and verifying compliance. A 12 page overview of the incentive auction process was posted by the FCC in The FCC Daily Business, on January 16, 2013. The report is an FCC staff summary. This may be of value to those members who have interest in the TV spectrum auction. Here is a link to the report. The underlying message is the potential affect on wireless microphones. The report shows three identified channels for “White Space devices,” plus whatever is left over from auctioning off 5 MHz from each 6 MHz TV channel. Note that nothing is directly mentioned of wireless microphones and where spectrum will come from to cover late breaking events. The FCC made no mention of current licensed operations in the TV bands. Related to this, the FCC recently released a statement announcing their “LEARN” program for the Incentive Auction. Here is a link to the website. Managing Social Media, Efficient Codec Design, ENG Technology, Lightning Protection and more at this live event! The programs for the Sacramento Ennes Workshop and the South Florida Ennes Workshop are confirmed! The Ennes Workshops, presented by SBE, were developed with the idea of offering affordable education on broadcast and media technology to broadcast engineers regionally. These all day workshops offer a wealth of information and can include up to 12 different presentations. And the time for networking with fellow engineers is one more reason to attend. The Sacramento Ennes Workshop takes place February 23. The cost for SBE members is $30 and includes breakfast and lunch. Non-members are welcome to attend for $40. The South Florida Ennes Workshop is on March 8. The cost for members of the SBE is only $35 and includes breakfast and lunch. We welcome non-members as well for $55. Subjects of this year’s workshops include social media, EAS, radio automation, ENG technology, TV master control, spurs, lightning protection and so much more. Visit our website for details on the full lineup of each workshop. Thank you to the hosts of each of these workshops! SBE Chapter 43 – Sacramento; KVIE; SBE Chapter 53 – South Florida; and Clear Channel Communications. The SBE now offers a library of online Project Management and Agile courses directly from the SBE website. Members of the SBE qualify for a 10% discount off these high-quality programs. These online courses are all self-paced and available 24/7/365, so you can learn from the comfort of your home or office, and on your schedule. They provide an affordable and convenient way to earn PDUs, refresh your knowledge in key areas or prepare for the PMP or PMI-ACP certification exam. Visit the SBE Project Management Online Course web page to view the library of available courses and sign up today. Looking for a convenient and affordable way to learn more about IP networking? The SBE has a series of webinars, tackling subjects such as the OSI model and layers, routing and switching, IP address management, and IPv6. Two of the webinars are available on-demand, and two of the webinars take place later this month and in February. Click here to find out more about any of these webinars. The TV Band White Space Device initiative continues to move forward in light of the FCC’s Broadband plan and the TV Incentive Auction rulemaking. This is an update of some of the recent notices released by the FCC over the last several months and how they affect wireless microphone operation. September 19, 2012 – The FCC Opens Wireless Microphone Registration of major event/production venues in the East Coast region: New York, New Jersey, Pennsylvania, Delaware, Maryland, Washington, DC, Virginia and North Carolina. The Public Notice released on this date outlines the procedures a venue (e.g. sporting event, large theatrical production, etc.) must follow to apply for registration for unlicensed microphone operation at the venue location. Initial application is with the FCC. If the request meets the criteria it is placed on public notice for 30 days for comment. If there are no objections the venue can then register their event through one of the approved White Space Database administrators. December 6, 2012 – The FCC issued a Public Notice authorizing approved TV White Space Database systems to provide service to unlicensed radio devices (aka TV Band White Space Devices). The FCC feels this is appropriate since there has been ample time since the September notice to register an unlicensed microphone venue. Concurrent with this notice the FCC opened up, across the nation, the registration for major event/production venues similar to what they did on September 19. These venues, requesting protection for unlicensed wireless microphones, can begin filing their applications for registration with the FCC. The FCC also anticipates expanding from regional to nationwide operations of TV White Space Database systems (i.e. service to TV Band White Space Devices) by mid-January 2013. Conclusion – The takeaway for broadcasters holding a BAS authorization for operation of wireless microphones in the TV bands is this: They should ensure their studios and other locations of frequent and known wireless microphone use are registered with an approved TV White Space Database system of their choosing. There is no cost to register a location for a licensed user. Understand that the states mentioned in the September notice are “HOT and On-Line” now. Failure to register your location may result in interference from a TV White Space device. With unlicensed wireless microphone registration now open nationwide, expect the FCC to soon also authorize TV White Space Device operation nationwide. For our members who work for companies that produce large events that use unlicensed microphones, consider registering those venues for protection. Do remember, however, you need to apply at least 30 days prior to the event and must meet FCC eligibility criteria. There are currently two approved TV White Space Database systems: Spectrum Bridge and Telcordia. I would expect the FCC to be approving others before long. At this time there are few TV Band White Space Devices in operation. Expect that number to grow in the near future. Be ready. This information was provided by Joe Snelson, CPBE, 8-VSB, SBE Vice President and Chairman of the SBE Frequency Coordination Committee. Snelson is vice president of engineering, local media group at Meredith Corporation. Interested in learning how to reverse engineer an unknown IP address? 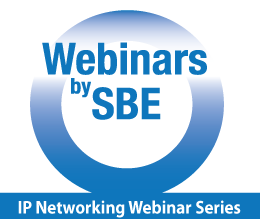 The SBE, in conjunction with Wayne Pecena, CPBE, 8-VSB, AMD, DRB, CBNE, is offering a webinar on January 31, 2013 on IP Address Management. This webinar will help attendees understand IP address principals and practices to properly design, manage, and support IP networks. This webinar will provide a realistic tutorial in IPv4 addressing principals, addressing schemes, and subnet design using private and public addressing. Also included are practical exercises to reverse engineer an unknown IP address and steps to designing an IP addressing scheme focused on a small broadcast facility. In addition, IPv6 addressing concepts will be introduced. The cost for members of the SBE is $49. Non-members can register for $75. Click here for more information.